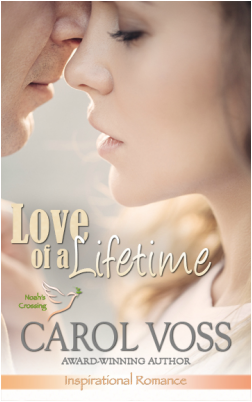 ​"Voss beautifully presents themes of forgiveness and family in this touching tale." He’d prayed all the way from Brazil to northwestern Wisconsin for God to spare his nonna, even when God and he both knew his prayer was a selfish one. Warm wind buffeting him, Tony Stefano leaned the Harley into the big curve and braced for his first glimpse of Nonna’s Victorian in ten years. He roared round the corner, and there it stood. Tall. Proud. Unbending. A lump caught in his throat. He felt just like he had when he’d left at seventeen...buried in circumstances he had no clue how to handle. Nonna’s demands. His overwhelming feelings for Maggie. And the final straw...Sheriff Bunker’s accusations. He gave his head a shake as if he could shake off the past and focused on the crisis at hand. According to Maggie’s brief email, Nonna had fallen down the stairs and injured her leg and who knew what else. A shock. Somehow he’d thought his grandmother would live forever. He had to see her one last time. He needed to ask her forgiveness before she went to meet her maker. Gut churning, he took the turn into the driveway. Tires popped gravel. He braked to a stop beside the polished, gray and white Suburban Maggie’s dad had let him drive a few times. He couldn’t believe she still had it. It must be a classic by now. Hitting the kill switch on the Harley, he lifted off his helmet and squinted up at the sagging roof of the old house. Chipped paint and rotting window sills. Keeping up a big, old house was like pouring time and money down a hole. But Nonna had always kept the place looking good with little cash, plenty of hard work and sheer determination. By the looks of it now, she was running low on all three. Why hadn’t she cashed those checks he’d sent? At least, her flowers were going stronger than ever. The place was draped in them, the air sweet with a fragrance that reminded him of Maggie. She’d loved Nonna’s flowers, especially the roses. He peered through hundreds of pink ones climbing the arched arbor over the brick walk and caught a glimpse of copper hair. His jaw clenched down on feelings he’d buried long ago. But he couldn’t deny seeing her again filled him with anticipation mixed with...sheer terror. Pretty much the way she’d affected him ever since he’d hit town when he was six, and she’d been four. He climbed off the bike and ducked through the roses. She stood near the back steps, hammer in hand, boards helter-skelter around her bare feet, a yellow T-shirt and worn, torn jeans skimming her curves. He should have guessed she’d grow into a striking woman with those new-penny curls and big, brown eyes. Eyes filled with trust and belief in him those years growing up when they were the only kids for miles. Innocent eyes that had reminded him of his protective side. Except for the day he’d betrayed her trust and taken her innocence. Sure, he’d been a head-over-heels-in-love kid of seventeen, but she’d been only fifteen. He’d asked God’s forgiveness, but he doubted he’d ever forgive himself. “I started out as soon as I got your email.” Stopping in front of her, he tried to prepare for an answer to the question he feared asking. “How’s Nonna?" He swept her into a bear hug, her fresh scent touting hours outdoors. Memories of innocent kisses popped into his mind. Did she still taste like strawberries? She pushed away, swiping at her eyes, a soft pink tinge flushing her cheeks and neck. What about you, Maggie? Have you thought about me? Had she thought about him like he’d thought about her?